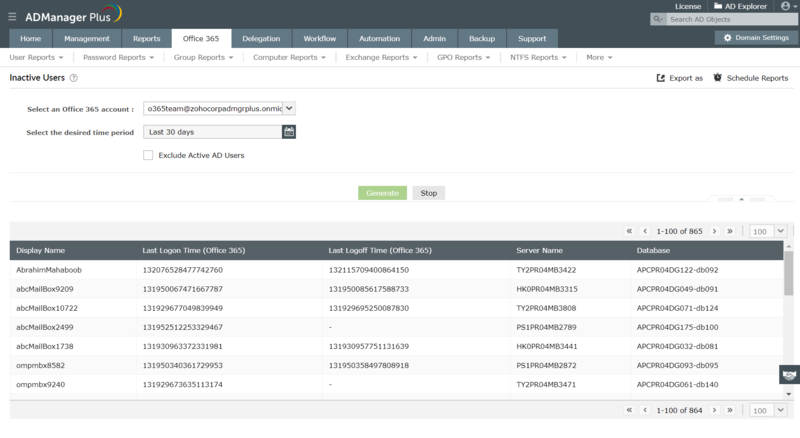 ADManager Plus' out-of-the-box Office 365 user reports enable you to find critical information regarding the users in your Office 365 environment without the need for complex PowerShell scripting. Using these reports, you can extract information like the number of active and inactive users, along with their corresponding license details, in your Office 365 environment with just few clicks from web-based console. This information significantly helps administrators manage user licenses and services efficiently like revoking from inactive users, assigning to unlicensed users, modifying which services are accessible to specific users, etc. ADManager Plus provides a UI-driven console for effortless reporting of Office 365 licenses. These reports help administrators make informed decisions, and free up licenses from users that no longer need them, and reassign them to unlicensed users or other users who might need them. This leads to overall effective management of Office 365 licenses and services, thereby helping administrators to control license-related costs. Office 365 user reports of this tool also allow you to export the results to PDF, CSV, XLSX or HTML, as per requirement. Office 365 users: View the list of all users present in your Office 365 environment with this option. You can also view details of the licenses and services assigned to each user. This information also enables administrators to verify whether the licenses and services have been allocated to the right users or not. Inactive Users: Identify the Office 365 users who have not logged on to Exchange online during a specific time period; you can specify any custom time frame as per your needs. You can also view important details such as, their last logon and logoff time. There is an option to exclude active AD users from inactive Office 365 users report if the configured Office 365 tenant/domain is directory sync enabled. This knowledge is essential to find out which user accounts have become obsolete and need elimination. Based on this information, you can effectively manage or reassign the inactive users' licenses to other users who might need them. Never logged on users: This report lists all the users in your Office 365 environment who have never logged on. You can free up the Office 365 licenses used by these accounts and reassign them to the users who actually need them. Like the inactive users report, the information provided by this report can also help you effectively manage Office 365 licenses in your organization. ActiveSync enabled users: This report displays all ActiveSync enabled users in your Office 365 environment. It generates critical details such as server name, database, and more. To manage the access of Office 365 data from mobile devices, it is very important for the administrators to know this information which ADManager Plus' ActiveSync enabled users report provides in just few clicks. ADManager Plus provides an extensive set of reports to simplify Office 365 reporting and also helps administrators make informed decisions for efficient management of their Office 365 environment. Besides Office 365, ADManager Plus also allows you to manage Active Directory and multiple versions of Exchange Server, from a single web-based console, via purely UI-based and completely script free actions.